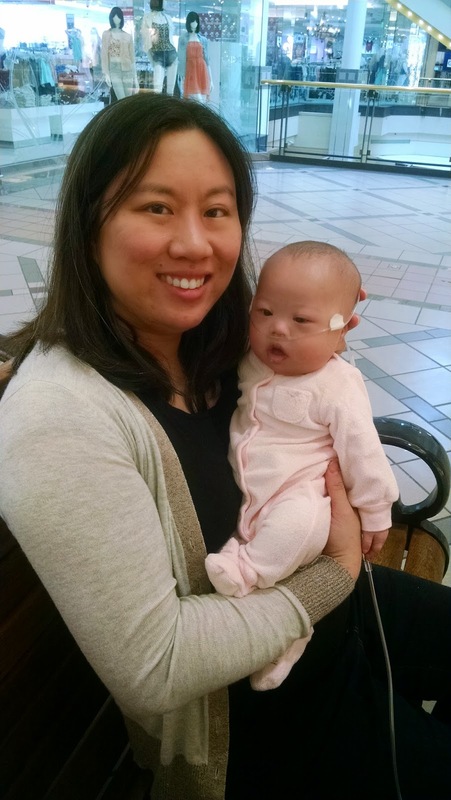 Evie the Extraordinary and Her Mommy: The Journey As We Go: First Trip to the Mall! Evie went to the mall for the first time a week ago! She slept through lunch at The Cheesecake Factory and a tour of all baby clothing stores at Cambridgeside Mall. I woke her up on a bench in front of Sears to feed her a bottle and then set up her G-tube. This was actually a big deal for us, because I was testing out G-tubing on the go. 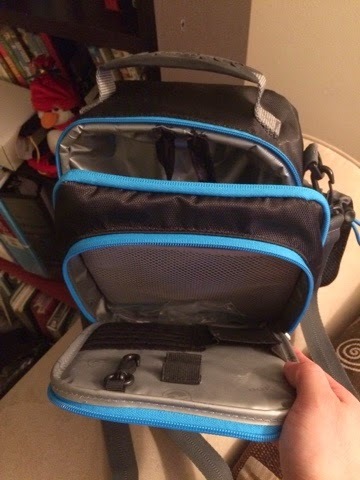 I rigged a lunch cooler so that I could tie a G-tube bag inside of it and set the feeding pump in the front pocket. It worked ok, but the logistics of putting the G-tube on, priming it on a bench, and then getting her in the carrier without tangling the oxygen tubes and the G-tube was still pretty hard. I'm waiting for sleep deprivation to make me forget something vital like clamping the tube and having formula from her stomach spray everywhere! Good to be out in society! I love this photo of you two beautiful girls! I live near cambridge side galleria. If you are in the area again, please let me know. Victoria and I would love to see you and meet baby Evie!